A fascinating walk up Slei Gill then a crossing of Booze Moor featuring lots of interesting remains from Arkengarthdale’s lead mining past. After enjoying a super walk along Fremington Edge at the beginning of November I was quite keen to do another walk in Arkengarthdale. After considering a few options I plumped for this route which gave me a chance to revisit Slei Gill for the first time in six years whilst also including a few paths around the edge of Booze Moor that I’d not previously walked on. There is a small National Park car park in Langthwaite, but for those who prefer not to pay for their parking there is a small parking space on the left hand side of the road by High Green. It was here that we parked. Crossing over Arkle Beck we entered Langthwaite, passing the Red Lion Inn, before taking the narrow road climbing steeply up the hillside towards Booze. Rather than staying on the road, which was the most direct route, we turned off left for a path through the woods contouring below Langthwaite Scar. At a junction we took the right hand option for a path that climbed much more steeply up through the woods before finally emerging near a ruined barn. Turning sharp right we then took a thin, and in places slightly precipitous path, above the woods to reach the access land on Booze Common. So far it had been a fairly cloudy morning but as we crossed the top of Booze Common the skies began to break. This was good timing as, in terms of views of Arkengarthdale, this was the best stretch of the walk. The views looking south towards Calver Hill and the long escarpment of Fremington Edge were particularly fine. Upon reaching Scotty Hill we cut down to the right to join the small road from Langthwaite to Booze, the superbly named hamlet situated on the hillside at the foot of Slei Gill. Passing through the hamlet we took the upper path of a couple of options heading for Slei Gill. A striking feature on the other side of Slei Gill was the hush below Fell End at the northern terminus of Fremington Edge. Soon the path was crossing a hush on our side of the valley. Hushing is an ancient mining method dating back to at least Roman times. A hush was created by damming water before releasing it to scour the hillside and reveal the mineral deposits below the soil. 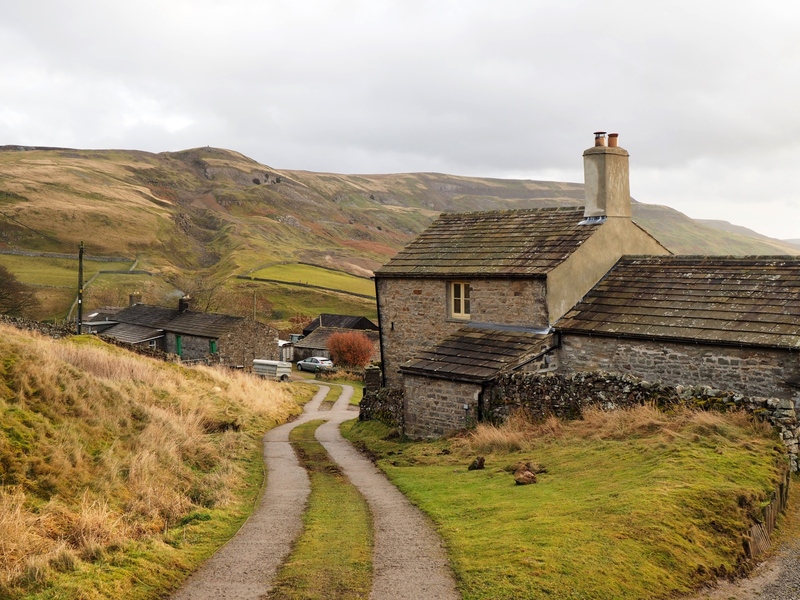 Some of the most impressive hushes to be found are in Arkengarthdale and nearby Gunnerside Gill in Swaledale. After taking a look around the hush we continued past a ruined building, called Sleigill House on the map, to drop down to the stream. A few small excursions from the path revealed a couple of nice waterfalls. Another nice waterfall higher up the stream was right alongside the path just after it had passed a small cave. After passing a lime kiln at the head of the gill we left the route of the public footpath (which at this point is virtually invisible on the ground) to take a more distinct path. This led us up alongside the unnamed gill to the west of Slack Wife Gill to reach a shooting hut. Deciding this was as good a spot as any for lunch we temporarily borrowed a couple of chairs from the shooting hut in order to sit outside and enjoy the view of Calver Hill which was illuminated by shafts of light piercing the cloud cover. After lunch we turned right on what is probably a shooters track. Following this for half a mile we then took a turn off to the left. After a further quarter of a mile of easy walking we left the track for a ten minute bash through the heather to reach the Ordnance Survey trig point on the summit of Booze Moor. Continuing in a general north-westerly direction we came to the top of Alcock Hush. Dropping down through this we went in search of the bridleway crossing Dry Gill. This proved to be elusive and we ended up on an increasingly broad path that passes just below Little Windegg before joining the much firmer track heading south towards Windegg Scar. Clearly the scene for a lot of past mining activity Windegg Scar proved to be much more impressive than I’d expected. The spoil heaps and general despoliation of the scar in some ways made it even more impressive. In some places the differents layers forming the Yoredale Series of rocks could clearly be made out. Certainly it is a place I’d like to go back to investigate in more detail in the future. Just south of Windegg Scar we dropped steeply down a bridleway to reach Windegg Lane before slanting down another pasture to Scarhouse Lane. Turning left on this we passed the impressive Scar House for the final easy stretch back into Langthwaite on a path above Arkle Beck. This was a super walk with lots of interest, especially for those who like industrial archaeology. After this and my previous walk along Fremington Edge I’m already planning another couple of excursions into Arkengarthdale in early 2017.